The way search engine results get presented has changed markedly since the days when Google simply showed 10 text results. Today, search results are visually much richer and frequently feature eye-catching elements such as images, maps, and rich snippets. Over the years various eye tracking studies have been helped us understand what people focus on when viewing search engine results. 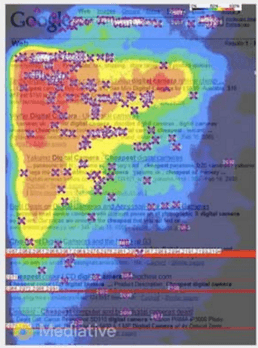 Ten years ago eye-tracking studies like the one below showed the first two or three search results attracted the most attention, with the first organic result getting about a third of all clicks. This week we stumbled over an eye-tracking study ConversionXL Institute conducted to investigate how recent changes in layout and content has impacted the way people view and click on search results. Below is what their heat map for a typical Google search result page looks like. According to this study, by far the biggest share of clicks now goes to rich data results which got 39.7% of all clicks. Consistent with previous studies, the top organic search result still receives substantially more clicks (20.7%) than any organic search result. Intriguingly, however, organic result #3 — rather than #2 — attracts the next most clicks (6.9%). People are always interested in how many clicks paid ads deliver compared to organic search results. This study showed that the top 3 ads collectively get the same number of clicks as the third organic search result, while the ads on the right of the page got very little attention. Below is a breakdown showing the distribution of clicks in Google search results. According to the study, many Google users first look at rich text on the right before reviewing actual search results. Users then briefly view the ads above the organic search results, before quickly scanning down to the first organic search result 3.3 seconds into their search experience. It’s evident people skim search results – on average Google users only spent an average of 3.4 seconds considering the page’s first five results. Just 0.764 seconds is spent looking at the first paid search result and 1.059 seconds on the first organic result. The study compared how users differed in their interaction with Bing and Google search results. Interestingly, users spent significantly longer looking at the first organic search result and significantly less time looking at the first ad search result on Google compared to Bing. Google has made several significant changes to search result pages since this study and it will be interesting to see what impact this has. As we reported back in February, they removed ads from the right side of pages; and now show up to four ads ahead of organic search results and three below. Then, in June, Google changed the yellow ad sign to a green one, effectively making the ads look more like organic results. From your own use of Google, you’ll be well aware that search results at the top of the page get the most attention. This study illustrates that the way users interact with search results pages has changed over the last 10 years in response to the changes in layout and content. But, despite this, the importance and significance of organic search as a channel for most businesses remains undiminished. Ensuring your business has high visibility in search results is essential.